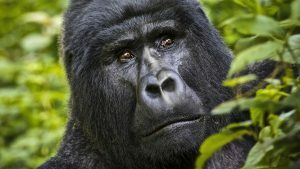 The 4 Days Gorilla Safari in Uganda Rwanda Gorilla Safari is a short break holiday that allows you to explore mountain gorillas both in Uganda and Rwanda. The 4 Days Gorilla Safari takes you to Bwindi Impenetrable National Park which has 400 out of the 880 mountain gorillas that are currently thriving in the world. Its challenging hilly landscapes with deep saddles make the trekking beyond gorillas. The Safari proceeds to explore the mountain gorillas in the Volcanoes National Park in Rwanda which is part of the Virunga massif where the 480 mountain gorillas are known to be thriving. 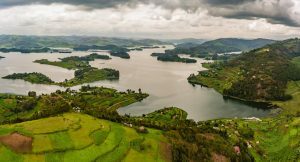 The recreational relaxation on Lake Bunyonyi dubbed the lake of a thousand Islands adds spice to the tourist experience. Embark on the drive to Bwindi Impenetrable National Park in the south west of Uganda 57km about 10 hours dive. You make a stop at Equator line crossing Kayabwe 77km from Kampala for amazing photo shots and water experiments that justifies the geographical divide between the northern and southern hemispheres. You will proceed on the journey driving through impressive country side landscapes including the traditional rangelands of Ankole before making a stop at Igongo Cultural Center for traditional lunch at its famous Kahwa Kanuzire restaurant. From here, you drive past Mbarara town and proceed to arrive in Bwindi in the evening for relaxation, dinner and overnight. After breakfast, gather at the respective park headquarters for a rewarding gorilla trekking encounter in the hilly forested landscapes of Bwindi dubbed the impenetrable. You attend to the briefing at 8am after which you head to the mist following your respective gorilla family trails in the company of the ranger guide and a group of 8 gorilla trekkers walking through their challenging hilly landscapes marked with dense undergrowth and mature trees. You eventually come across the critically endangered mountain gorillas thriving in their natural habitat. The one hour is available for you to maximize the experience where you can photo as well. The trekking encounter tend to last 2 – 8 hours after which you retreat from the activity and get back to starting point and embark on the transfer to Volcanoes National Park in Rwanda crossing via Cyanika boarder post. You enjoy the magnificent views of the Virunga ranges before arriving in the evening for relaxation, dinner and overnight. Undertake a recreational boat cruise after a relaxed breakfast to explore the lake of a thousand Islands. You cruise amidst the scenic Kigezi Highlands and the views of a range of Islands that are within the lake. Lake Bunyonyi has 29 Islands. You retreat from 2 – 3 hour activity and embark on the transfer back to Kampala. You make a stop at Igongo Cultural Center 12km past Mbarara for traditional lunch and then continue on the drive to Kampala arriving in the evening for relaxation, dinner and overnight.